Alice Seely’s Friends Pins are made of lead free pewter. They are made in her studio in Hondo, New Mexico. Pewter is 30% lighter than silver, doesn’t tarnish, and can be cleaned with fine steel wool. 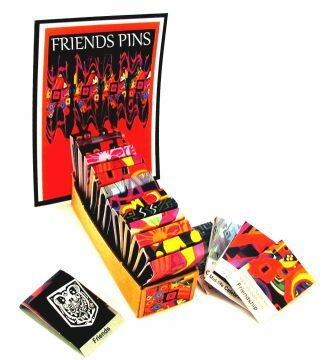 The initial order of Friends pins comes in a cardboard box display box with18 pins, including duplicates of best sellers. There is no minimum of pins in following orders, choose any pins you want on an individual basis. We take back in trade any pins that don’t sell.